Chicken Fat: Give Them Hell Harry! On this day is history, Harry S. Truman (1884-1972), the 33rd president (1945-1953) was born in Lamar, Mo. In the picture above, which was on the cover of the Chicago Tribune the day after the election, shows Harry holding up the headlines that he lost to Dewey. It is wrong. 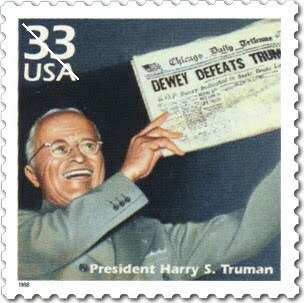 Truman won the election. The joke is on the newspaper. It is also reminder not to put all your trust in polls and it is also reminds us of inflation - look at the price of the first class stamp! Harry was the vice president under Franklin D. Roosevelt. When FDR died suddenly Harry stepped up to the plate. He had to make some tough decisions. One that comes to mind is firing General Douglas MacArthur for getting trigger happy in the Korean Conflict or War. It was also Harry's decision to drop the atomic bomb on Hiroshima. After he left office he spent many hours in front of a camera explaining why his actions was justified. He is also remembered for some of his snap decisions, like saying he was going to punch a writer in the nose for giving his daughter a bad review on her piano recital. He was also remembered walking over a mile each day in his hometown Independence, Missouri, near the end of his life, when he was in his 90s. *Although I do like what President Dwight Eisenhower said in his farewell speech: "Beware of military - Industrial Complex." - or something very similar.